Six films from the start of Akira Kurosawa's career demonstrate the emergence of a profoundly influential directorial vision. 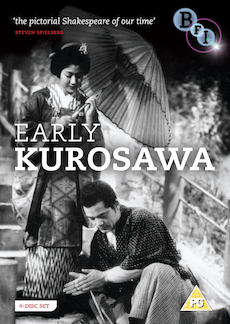 Available on DVD for the first time, this 4-disc set contains 6 films from legendary auteur, Akira Kurosawa, made at the start of his career and demonstrate the emergence of a profoundly influential directorial vision. Kurosawas assured debut about a young mans spiritual journey through the study and practice of judo. This sequel reunites most of the principal cast from the original and follows Sanshiro face a new set of enemies whilst continuing his quest to become a judo master. An artful propaganda film that anticipates the social realism of his post-war films, The Most Beautiful provides a fascinating portrait of female volunteer workers in an optics factory manufacturing lenses for binoculars and gunsights. Adapted from Noh and Kabuki theatre, this classic tale of deception sees a lord and his bodyguard disguise themselves as monks to bypass an enemy roadblock. Kurosawa's first post-war film stars Ozu regular Setsuko Hara as Yukie, a privileged daughter of a professor who takes a soul-searching journey through rural Japan and comes to question her values. A bitter-sweet story of young love set in the devastation of post-war Tokyo reminiscent of Frank Capras social realist comedies.